SMI Evaporation offers a full range of products for mechanical evaporation, from a simple standalone machine to fully automated systems with over 50 machines all computer controlled, we have the proper solution for your needs. 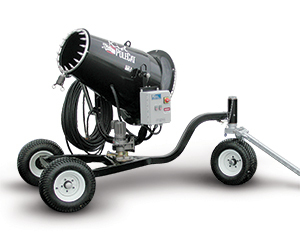 Most customers are moving to automated machines that allow both drift control and maximum evaporation. Drift control is an important consideration. As the water is evaporated, the dissolved solid can remain suspended, and the tiny particle produced from this process can travel great distances in high winds. 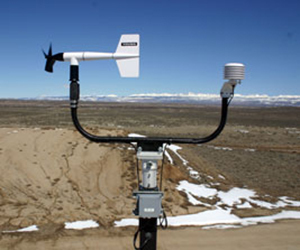 SMI offers a wind speed and direction device that can provide input to allow the unit to be started and stopped based on defined drift limits. Each location can be specifically customized for your situation. The temperature and relative humidity can also be monitored to allow optimal water flows through the equipment and to provide 100% evaporation. In very dry and warm conditions more water can be evaporated than in moister and colder conditions. We have found that achieving 100% fluid evaporation is the most effective method. Using customers input of weather allows us to optimize performance while staying within established drift boundaries. VFD controls are used on the pump to provide the exact amount of water for 100% evaporation. Over saturation is avoided and maximum efficiency is achieved. The SMI Evaporation system can be controlled with remote SMI Smartwater software. These machines can talk with a main site control panel PLC with touch screen display or to a central computer to control and enter system and machine set points and values. This can then be linked via communications to each machine in the system. Each individual unit can have a small PLC in the control panel to control only that machine and will have an automatic flow to temperature curve, managed by the pump VFD to match evaporation flow rates to the current climate. The goal is for 100% evaporation and to avoid air saturation. Each machine also has individual wind control set points for managing drift, so only machines within these set points range will operate. Basically each machine has its own brain and will work within its own parameters and set points. The software collects live data and can also generate a variety of trends and reports to evaluate the efficiency of the system. 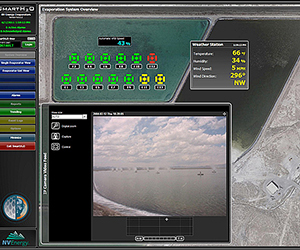 One other feature: SMI can install a live web cam at the evaporation location so you can watch live from the remote computer to also monitor the system from remote locations (this is great for remote monitoring and tech support).